Breaking into the biz (as a preteen): Camuto’s first gig in the industry was at the ripe age of 12—he got a job at a shoe store on First Avenue in Manhattan. At age 18, Camuto got a job at erstwhile celeb-favored kicks purveyor I. Miller. Banking on style: The designer worked for the Japan-based Bank of Sumitomo in 1970 to build a shoe business. Camuto turned to Brazil to source high-quality shoes that were more affordable than from Italy. While at Bank of Sumitomo, Camuto met his future business partner, Jerome Fisher. To the nines: Fisher and Camuto decided to strike out on their own with a shoe label in 1978. As for the name? The duo’s offices at the time were located at 9 West 57th Street in NYC (the Solow building), ‘9 West’ became ‘Nine West,’ and the rest is history. The brand’s first standalone store debuted in Stamford, Conn. in 1983. Quite a big deal: Nine West went public in 1993; six years later, the company was sold to The Jones Group Inc., to the tune of $900 million. Solo act: Once Camuto’s noncompete contract from the Nine West sale was up, he founded Camuto Group in 2001 with his third wife Louise Camuto. He created private-label shoes for Dillard’s and also he acquired footwear licenses for Max Azria, BCBG, and BCBGirls. The endeavor developed into a multibillion-dollar empire. Today, the brand comprises over 30 sportswear and lifestyle categories. They also offer up services such as design, sourcing, marketing, and production for over 5,400 retail outlets globally. In 2005, Camuto introduced a namesake label. Expanding the Camuto name: Currently, the Camuto portfolio includes labels such as VC Signature Vince Camuto, Louise Et Cie, and Two by Vince Camuto. The Camuto Group also has key partnerships or licensing agreements with the likes of BCBG Maxazria, Lucky Brand, and Sanctuary. They also create private label shoes for the likes of Ann Taylor and Banana Republic. Getting into the celeb realm: In 2005, Jessica Simpson signed on with the company to start a namesake clothing brand, which is currently valued at over $1 billion. Camuto also helped out with the launch of Tory Burch‘s shoe label, which made a major splash in 2006 thanks to her iconic Reva ballet flat. Bona fides: Camuto racked up accolades for his shoe-centric innovations and success throughout his career. In 1994, he was recognized for Nine West as Chain Retailer of the Year by Footwear News. In 2001, the same publication honored him with a Hall of Fame Achievement Award. In both 2007 and 2008, Camuto made it on Footwear News’ Power 100 list. In 2012 he was presented with an ACE Visionary Award; a year later, Nordstrom named him a Partner in Excellence. 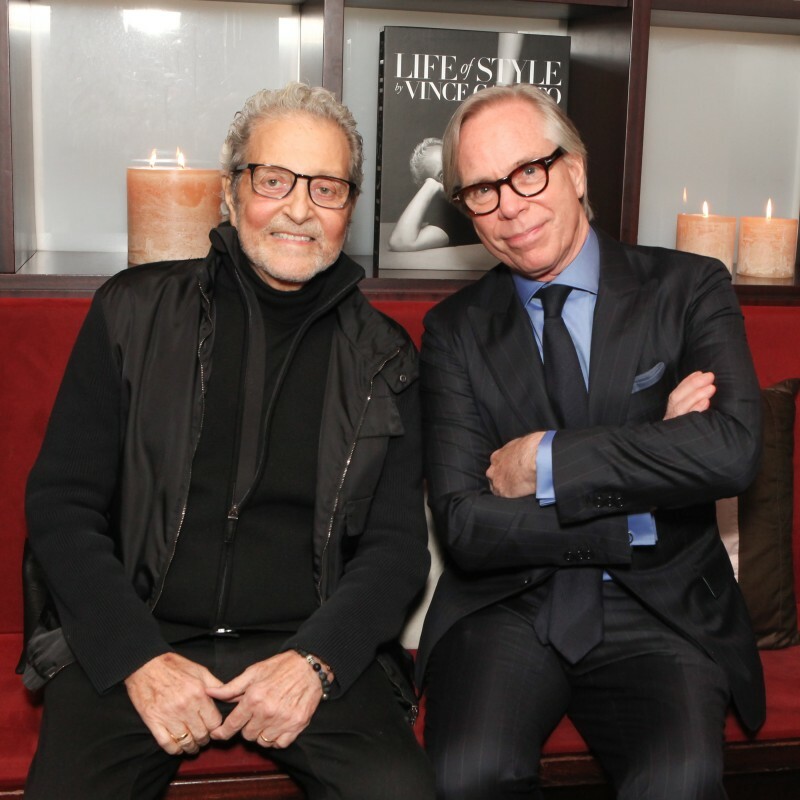 Plus, last year, Footwear News aptly gave Camuto a Lifetime Achievement Award. Camuto’s CFDA ties: In 2008 he became the inaugural Corporate Affiliate Member of the CFDA, through which he mentored members about building business alliances. He officially joined the CFDA as a Member in 2012. Giving back: Camuto will be remembered more than just footwear—the designer had quite the philanthropic touch. He contributed to charities including St. Jude’s Hospital, Leukemia Society of America, Ronald McDonald House, and The Domestic Abuse Awareness Foundation, as well as serving on the board of Wish-And-A-Smile. For the hommes: In 2012, Camuto’s eponymous line dabbled in men’s offerings for the first time. The impetus for adding lads’ looks to the mix? Camuto’s son’s troubles finding a well-fitting suit. Fatherhood first: The designer was honored in June 2014 at the 73rd annual Father of the Year Awards in NYC, hosted by the National Father’s Day Council, for his exemplary parenting. Past honorees included the distinguished likes of JFK and Colin Powell. Awe-inspiring, non? In addition to his brood of five children, Camuto is survived by his wife, his sister, and one grandchild. Camuto’s fabulous East End spreads: Dubbed Villa Maria, Camuto’s 21,000 square-foot abode in Water Mill dates back to 1887. The pristinely appointed home—which was once a convent!—scored major Architectural Digest coverage. The shoe designer, who purchased it in 2005, put it on the market 2013. Camuto also owned a lavish, oceanfront Southampton home, called Wooldon Manor, built in the early ‘30s. The Tudor-style, 10,000-square-foot manse was once owned by Merrill Lynch’s Edmund Lynch. It was sold in 2013.